– PX4Flow is an optical flow smart camera. It has a native resolution of 752×480 pixels and calculates optical flow on a 4x binned and cropped area at 250 Hz (bright, outdoors), giving it a very high light sensitivy. Unlike many mouse sensors, it also works indoors and in low outdoor light conditions without the need for an illumination LED at 120 Hz (dark, indoors). It can be freely reprogrammed to do any other basic, efficient low-level computer vision task. optical flow sensor is not a hand-play PIX peripherals , if you’re not sure if you can complete the seting by yourself separately or not , please carefully orders, do not waste time and money. PX4Flow is an optical flow smart camera (it provides the image for setup purposes, but it not designed to capture images like a webcam). It has a native resolution of 752×480 pixels and calculates optical flow on a 4x binned and cropped area at 400 Hz, giving it a very high light sensitivity. Unlike many mouse sensors, it also works indoors and in low outdoor light conditions without the need for an illumination LED. It can be freely reprogrammed to do any other basic, efficient low-level computer vision task. For PX4IOAR users, here is a setup guide. PX4FLOW is not designed as a camera, but does all processing on-chip. The image output is only intended for focusing the lens. In QGroundControl, click on Configuration → Firmware Update. Hit the big green “Scan” button. Enjoy the live view and focus the camera by loosening the locking screw and turning the lens at an object at 3m distance. If you want to get higher res to focus the sensor, go to Config → Advanced Config and set the “VIDEO_ONLY” parameter to 1. Note: Applies to all PX4 FMU versions, including all versions of Pixhawk. The module will be detected on boot, flow data should be coming through at 10Hz if the autopilot is connected via USB. Flow data is transmitted via wireless at a lower rate. The default orientation (meaning: zero rotation) is defined as Y on flow board pointing towards front of vehicle as shown in the following picture. The orientation of PX4Flow can be set at PX4 flight stack firmware’s parameter. The detail parameter is listed below and more can be found here. If the bus lines are twisted-pairs, each bus line must be twisted with a VSS return. Alternatively, the SCL line can be twisted with a VSS return, and the SDA line twisted with a VDD return. In the latter case, capacitors must be used to decouple the VDD line to the VSS line at both ends of the twisted pairs. If the bus lines are shielded (shield connected to VSS), interference is minimized. However, the shielded cable must have low capacitive coupling between the SDA and SCL lines to minimize crosstalk. 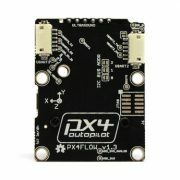 The PX4FLOW module outputs MAVLink packets on USB and serial port. Use QGroundControl to read data from the module. An I2C interface for sensor data reading is offered as well. Third party libraries are available to connect and integrate PX4FLOW data in your projects. USB: Baud rate is not relevant (USB ignores it): OPTICAL_FLOW message, OPTICAL_FLOW_RAD message, HEARTBEAT message, image. I2C1: latest Flow value (i2c_frame) and accumulated Flow (i2c_integral_frame) values since last I2C readout available for readout. The 7 Bit I2C Address of the Flow Module is user selectable. Using the solder jumpers on the back of the flow board you can add an offset to the baseaddress 0x42. The address range for the 8 possible choices is: 0x42 – 0x49. The ortho photo below shows that a flight on the park roads is accurately measured. This was done with a PX4FMU on a 7“ quad flying at about 1.6 m altitude in manual flight. No GPS, only PX4FLOW integration of position. The flow module as been accepted as paper to the International Conference on Robotics and Automation (ICRA 2013) in Karlsruhe, Germany. The following are third party libraries that can be used to integrate the flow module in your projects . px-ros-pkg: A PX4FLOW ROS (Robot Operating System) interface, maintained by Lionel Heng (hengli@inf.ethz.ch). arduino-px4flow-i2c: An Arduino library wrapping the I2C interface, maintained by Laurent Eschenauer (laurent@eschenauer.be). The correct optics are delivered by 3D Robotics already mounted and focused. The focal length influences the maximum measurable velocity.